Koko, the gorilla who became famous for learning sign language, has died in the United States. The California-based Gorilla Foundation that kept and studied Koko announced that she had passed away in her sleep on Tuesday. She was 46 years old. Koko was a western lowland gorilla born on July 4, 1971 at the San Francisco Zoo. The very next year, Koko began working with Dr. Francine Patterson, who taught her American Sign Language. Her keepers said Koko also understood some spoken English. The teaching experiment became part of a larger project at California’s Stanford University in 1974. The Stanford project later expanded to include another western lowland gorilla, named Michael, who also learned sign language. Five years later, the Gorilla Foundation was created in the Santa Cruz Mountains, about 40 kilometers south of San Francisco. The two gorillas were moved there. Michael died in 2000. Another gorilla named Ndume lived with Koko at the foundation. Researchers say he does not have the same sign language abilities as Koko and Michael. Koko appeared in many films and television documentaries. She appeared twice in the magazine National Geographic. Her 1978 cover showed a photograph Koko had taken of herself in a mirror. The second issue, in 1985, included the story of Koko and her pet cat, named All Ball. 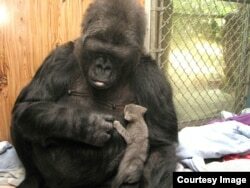 The story led to the popular book “Koko’s Kitten,” which can be found in many schools worldwide. In 1998, Koko appeared on the internet in what researchers called the first “interspecies chat.” The gorilla used the event to communicate through an interpreter to directly answer questions from fans. In 2001, Koko got publicity again when actor Robin Williams went to visit her and talked about how moved he was by the experience. “We shared something extraordinary – laughter,” the late actor said at the time. Western lowland gorillas are threatened in their native environment of central Africa. The Gorilla Foundation says it will continue to honor Koko by continuing to carry out ongoing projects. These include conservation efforts in Africa and expanding the Maui Great Ape Sanctuary in Hawaii. In addition, the foundation says it plans to create a sign language computer app including Koko that is designed to help gorillas and children alike. Bryan Lynn wrote this story for VOA Learning English, based on reports from the Associated Press and Reuters. Mario Ritter was the editor.